Before going into some of the details of building mechanical walkers, lets first take a look at what makes them tick: their linkages. Did you notice our safety (bike) helmets? Mechanical linkages are all around us, from simple linked-levers like scissors, to more complex systems like windshield wipers or mountain bike suspensions. Even our knees utilize linkages. In essence, linkages “link” bars to one another at rigid joints that allow the bars to move, like how the links in a bicycle chain can rotate around their connecting pins. If one of these chain links is fixed to a stationary position, then we can turn a simple chain into a linkage system, and by changing the length of the links and how they are connected to each other in just the right way, the linkage can transform motion at one joint to very different motion at another joint. For example, a commonly used linkage is the 4-Bar Linkage which can be configured in an infinite number of ways. Below is an example simulated in Scratch. ​​ Linkages played a pivotal role in the industrial revolution since they allowed mechanical motion to be transformed to perform useful work, such as the linear motion of a steam engine’s piston to the circular motion required to run a factory’s machines, and without the need of electronics or computer control. 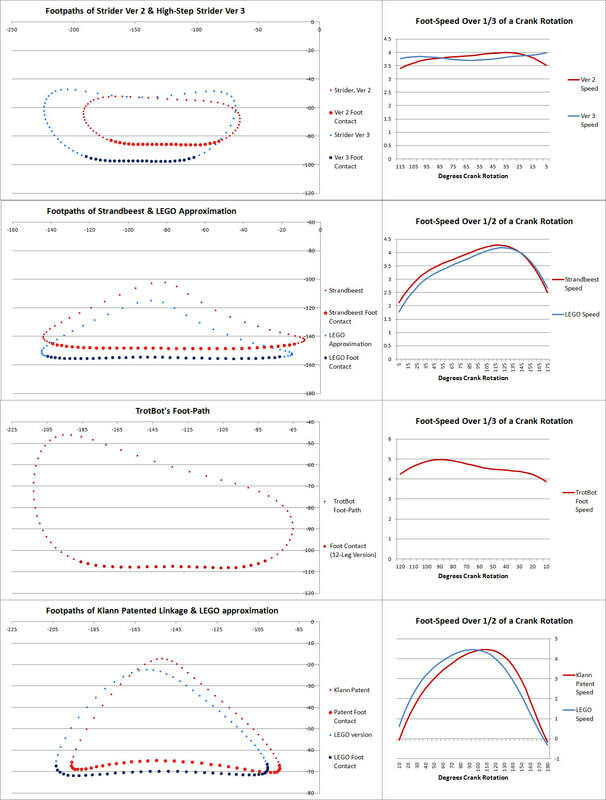 While linkages are still very important, more complex motion can now be generated with the help of computer control of additional motors. A linkage mechanism with a single degree of freedom (DOF) means if a single joint is moved, then all of the remaining joints have to move in response. Hence, they only require one motor to control one joint, whereas mechanisms with 2 DOFs require 2 motors controlling 2 joints, 3 DOFs require 3 motors controlling 3 joints, etc. With single DOF mechanical walkers, the joint that is moved is a crank that is connected to a crankshaft and motor . Single DOF mechanisms can make designing walking robots both easier, and harder. Single DOF mechanism design can be easier since the motion and control of only one motor has to be considered. On the other hand, mechanism design can be harder since walkers may require specific leg motion that is impossible to generate with a single DOF mechanism, or the motion may require an overly complicated linkage system, a "kluge". Straight-line linkages are especially useful since they transform circular motion at one joint to linear motion at another joint, or vice versa, and allowed the steam engine to replace the water wheel, dramatically accelerating the industrial revolution. Mechanical walkers typically use linkages that approximate straight-line motion, and some of the most famous straight-line linkages are simulated here. their path should be as flat as possible so that the machine doesn't bounce, which would also increase the torque and power required to walk, as you can see in this experiment with TrotBot. their horizontal speed should be as uniform as possible so that they don’t skid or shake the machine, and don't consume power from constantly accelerating then de-accelerating the robot. If the foot-speed varies, then the addition of a hinged foot with a curved bottom can help because it will passively rotate in compensation, as you can see in this experiment with Klann's mechanism. Below highlights the foot-contact with the ground, and the horizontal foot-speed of Strider, Strandbeest, TrotBot, and Klann. Furthermore, oval-shaped foot-paths are better suited for rugged terrain than are teardrop-shaped foot-paths, because the narrow end of the teardrop means the robot won't be able to reverse out of terrain that got too rugged, leaving it stranded, or that it can get stuck astride obstacles. TrotBot's foot-path is also somewhat tear-drop shaped, but by adding a "heel" TrotBot steps about as high in both directions to avoid getting stuck astride obstacles. ​​Without its heel, TrotBot's rear legs probably wouldn't have cleared a few of the 2x4s in the below video. ​ The above foot-path simulations are from the perspective of the moving robot, but, obstacles on the ground are not moving. 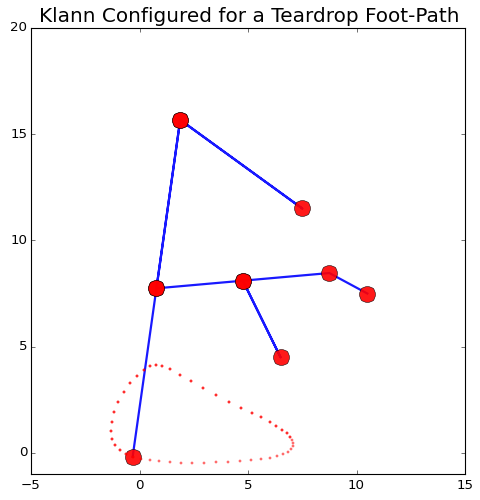 Therefore, to determine how well a robot can step over obstacles we should also consider the ground-perspective foot-path by plotting it as the robot is moving. As you can see in the below simulation, the robot's speed flattens both the lift and lower portions of the foot-path, increasing the likelihood that feet will jam on obstacles. ​​ Another characteristic of Strider's foot-path worth noting is how the bottom halves of the lift and lower phases are nearly vertical, which means that the robot will have less of a tendency to slow down when stepping on/off obstacles or when the terrain's slope changes abruptly, resulting in a more efficient gait on rugged terrain. This is further explored in this walking tanks post. ​​ To minimize the number of legs a walker requires, the linkage should maximize the percentage of time the foot is in contact with the ground per axle rotation. To say it another way, the linkage should minimize the percentage of time it takes the foot to be lifted and returned to the front of the foot-path. ​ Here are a few simulators for visually optimizing leg mechanisms, or for making LEGO approximations of mechanisms. 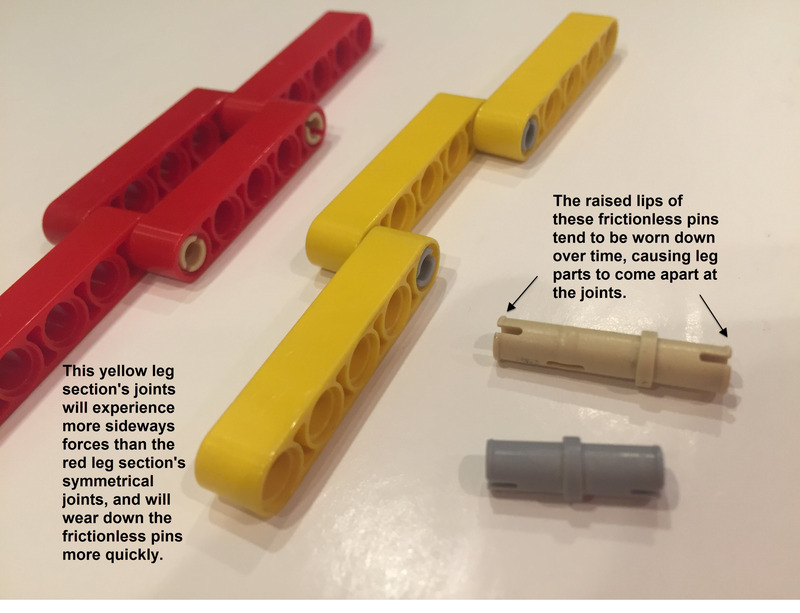 For example, below is Jansen's leg mechanism alongside a LEGO approximation of it, which was easy to find with some help from this Jansen linkage calculator. The requirements for walker stability varies greatly depending on their size. Small-scale, 8-legged walkers can often get away with only three feet on the ground, which may cause them to shuffle or lumber as they move about, but may not impair their ability to walk. In many cases this can look very interesting, and sometimes the more a walker lumbers, the more lifelike it seems. However, the larger the walker is, the more the lumbering will take its toll on walking performance, efficiency, and ultimately, the parts. Thus, having four feet in contact with the ground at all times like a four-wheeled vehicle is usually a requirement for large-scale mechanical walkers. With our first version of our SUV-scale TrotBot we only had three feet on the ground during portions of the axle's rotation. This also occurred at LEGO-scale where it wasn't a problem, but when our SUV-scale version encountered these tripod points the entire machine would bend and the fourth foot would crash into the ground, where it would then skid since it's horizontal speed was too slow at that point in its foot-path. After this discovery we had to add a lot of modifications to get a decent walk out of TrotBot Ver 0, such as the addition of active feet, which increased each leg's percentage of ground-contact per crank rotation . Six-legged walkers are stable with only three feet on the ground if their feet are arranged like an equilateral triangle, which is how we designed Hexapod TrotBot. However, just like how 3-wheeled, tripod cars are less stable than standard, 4-wheeled cars, mechanical walkers with 3 feet on the ground are less stable than those with 4 feet on the ground, and hexapod walkers with tripod gaits don't perform as well on rugged terrain as their 8-legged versions. ​ ​ Walkers are subjected to more stress than are wheeled vehicles. 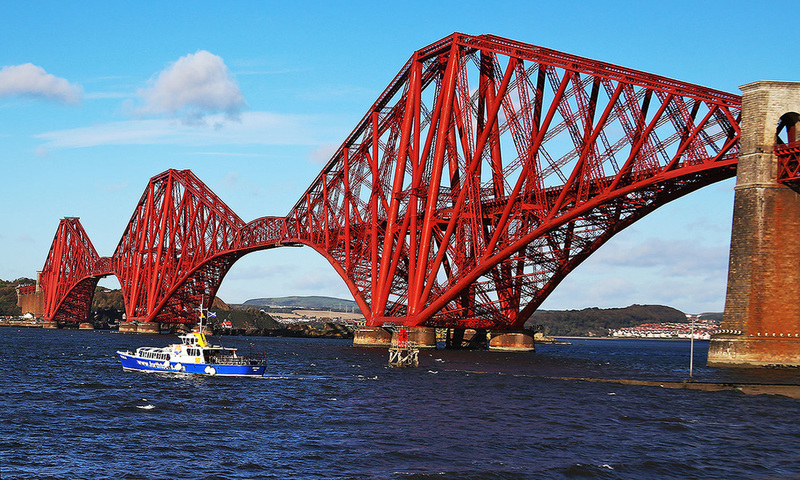 In order for walkers to bear the stress with a minimal amount of structure and weight, it is a good idea to think of them as a statics problem, similar to the structural challenges of building a strong bridge - with the additional challenge that the bridge’s support columns will be moving under the it! 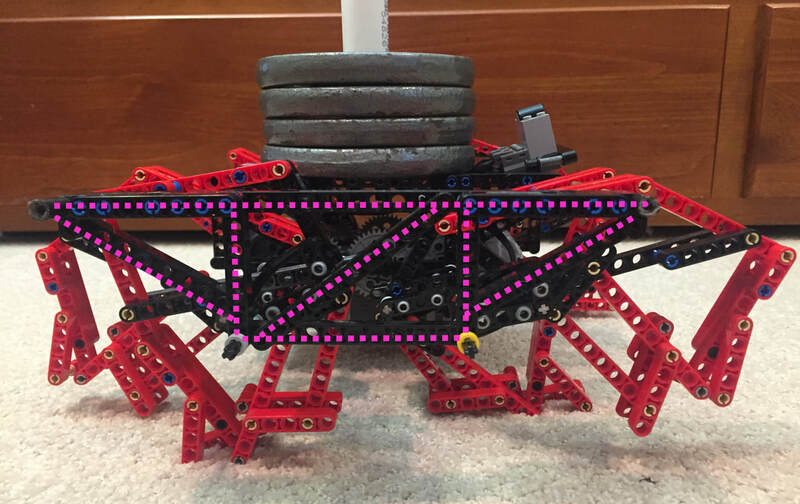 ​​ If you are building walkers at LEGO-scale, this shouldn’t be a significant problem, and here are some ideas for how to make rigid, triangle-based frames with LEGO's Technic beams. However, as objects are scaled up the strength of the object increases at a rate lower than that of the weight, because strength is proportional to the square of the scale (the surface area), whereas weight is proportional to the cube of the scale (the volume). This reduction in strength-to-weight ratios as scale increases explains why ants can lift 100x their weight, and also why if an ant were enlarged to human size they probably couldn't even stand, let alone lift a car. Scaling up a walker means you have to solve this strength-to-weight ratio problem, and the larger the walker is, the more challenging this problem will be. 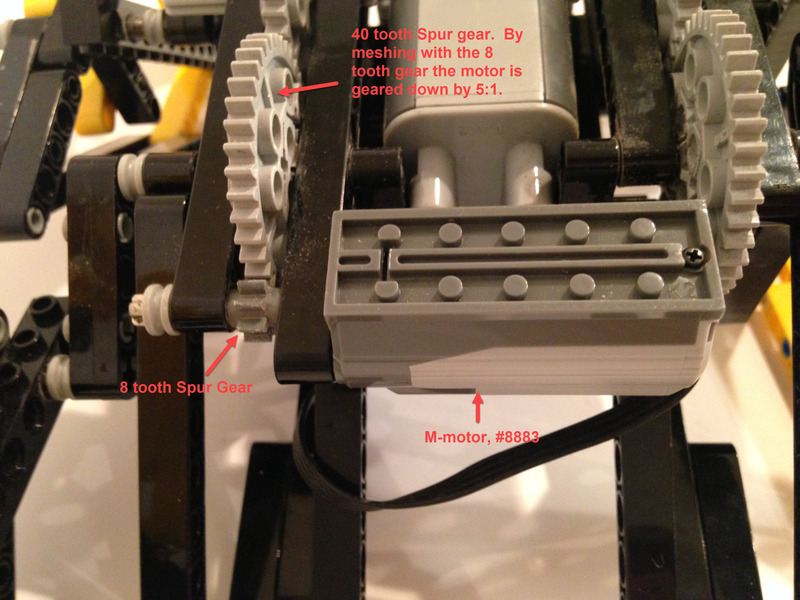 ​​ If you're a teacher and want to add some fun, structural engineering challenges to your curriculum using LEGO and some DIY testing gear, a few of the challenges we used to prepare for scaling up TrotBot are summarized here at Tufts' LEGO Engineering website. Walkers with bumpy gaits stress frames and legs even more. So, for smoother gaits, large walkers should be supported by their legs in all phases of axle rotation, and in all anticipated walking terrain. 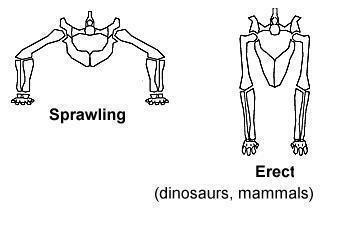 Also, the leverage of long legs can put a tremendous amount of force on the leg's joints when walking on uneven terrain or when turning them tank-style, so trussing them to increase strength without adding much weight should be considered, especially in the side-to-side dimension. ​ When building large walkers it is important to remember that the legs possess a side-to-side, or "Z" dimension as well. While this seems obvious, the 2D nature of many walking linkages can lead designers to primarily think of them in the 2 dimensional plane where their linkage behavior occurs, which is why they are also called "planar mechanisms". While the Z dimension has no impact on the linkage characteristics of planar mechanisms, building the leg sections wide is incredibly important from a structural engineering perspective, otherwise sideways forces and resulting torque on the joints can snap the legs like twigs, especially when turning walkers tank-style. The way that we solved this problem with TrotBot was to truss each leg in the sideways dimension, creating lightweight but effectively very wide parts that could withstand sideways forces. To illustrate the strength gained by trussing, TrotBot's leg in the above video weighs only 6 pounds, but 4 of them were able to support TrotBot Ver 1's 450 pounds six feet above the ground, while lumbering no less. If a walker's legs are located far from the inner frame then the design of their connections to the frame becomes another structural engineering challenge. With our LEGO-scale builds we solved this by using metal rods of 3/16" diameter, the diameter of LEGO Technic's beam holes. However, with larger walkers these rods, no matter what material we made them out of, bowed under the weight of the mechanism. Our solution to this problem was lightweight cables linking the bottom of the frame to the support rods, similar to how a Cessna's high wings have diagonal attachments to the fuselage to prevent them from being torn off by the force of lift on the wings. In the below left picture the cables weren't tensioned and you can see the support rods bending in a smile, whereas in the right GIF the cables were tensioned and the support rods are straight. ​An alternative to cable attachments underneath the rods is to add a truss above the rods that can resist compression. Narrower walkers put less stress on the support rods, and require less structure since the robot's weight is more centered over the legs, similar to how the legs of dinosaurs and mammals can bear weight more efficiently than can the sprawling legs of lizards. Wider walkers are also harder to turn tank-style, since mechanical walkers lack differentials. Mechanical walkers typically have 8 to 12 legs configured in front/back pairs, staged out from the frame. This means that torque has to be transferred all the way from the inner frame to the outside leg pair. This can be achieved through a system of cranks attached to crankshafts (axles). However, this system can also become overextended and begin to bow under the robot's weight. Therefore, for large walkers it's critical that this crank/axle system is supported between each leg pair via diagonal beams linking the axle to the support rods. ​​ Torque also needs to be transferred from the cranks to the axles. This is the opposite of bicycle crank arms, where the rider needs the pedal to rotate independently of the rotating crank arms. 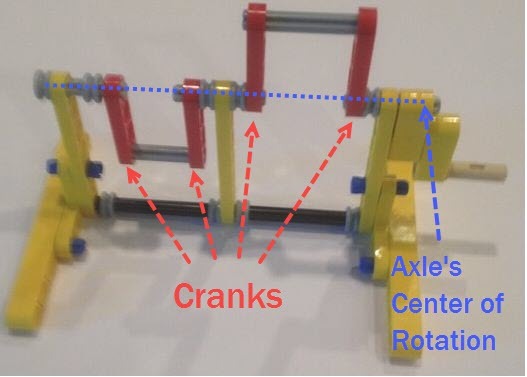 As walker cranks rotate they need to transfer that rotation to the adjacent crank so they can remain in the correct phase with respect to one another. This is done by locking the joining axle to each crank via keyed axles, or by using square or hexagonal axles and hubs. ​When building heavy and wide walkers at LEGO-scale, such as walkers using the EV3 brick, you may need to replace LEGO's plastic axles with steel axles, since LEGO's plastic axles twist easily under torque. Large-scale walkers can permanently twist steel axles in the same way if enough torque is applied. ​​​ After you solve all these kinematic and structural engineering challenges, motorizing your walker can be the fun part, and is an easy thing to do at smaller scales. However, the motor may need to be geared down because the RPM can be too high for most walkers. 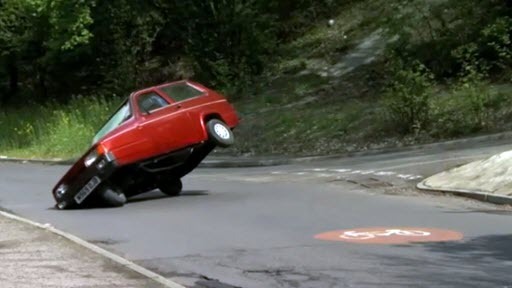 Furthermore, one full rotation of the axle for a walker will generally cause its foot to move further than what a wheeled vehicle would - with small wheels at least. Also, without being geared down, the motor's stall torque may be too low for the walker, meaning the robot will be under-powered. To illustrate, the following image is of the underside of a walker that has been geared down by a 5:1 ratio. It's also worth noting that the 8 tooth spur gear is showing signs of wear, even though it's axle is supported on both sides with Technic beams, and will likely need to be replaced soon. While on the subject of wear, another LEGO part that walkers tend to wear out after a dozen or so hours of operation are the leg joint's frictionless pins. The raised lips at the end of the pins tend to wear down over time, and the leg parts will no longer join with a sharp "snap", and will tend to come apart. You can reduce this tendency if the leg's joint connections are symmetrical like the red leg section in the image below. In contrast, the yellow leg section's joints will bend sideways somewhat while bearing weight, and will therefore wear the pin's lips more quickly.